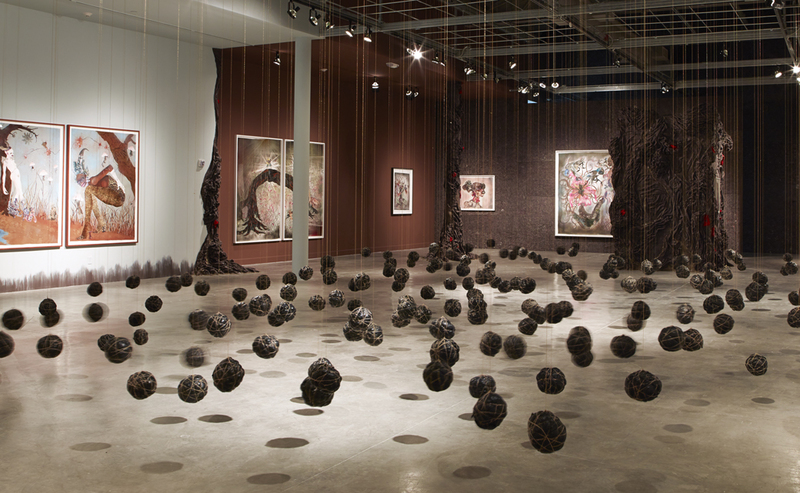 The Museum of Contemporary Art North Miami will present “Wangechi Mutu: A Fantastic Journey,” a comprehensive survey of the Kenya-born, New York-based artist whose multi-faceted work captures 21st century global sensibility. The exhibition includes more than 50 works from the mid-1990s to the present, including a new site-specific mural and a black box theater projection of her newest video. “Wangechi Mutu: A Fantastic Journey,” part of MOCA’s Knight Exhibition Series, will be on view at April 18 through July 6, 2014. Since earning her M.F.A. from Yale University in 2000, Wangechi Mutu has come to be regarded as one of the most inventive and critically-engaged artists of her generation. Combining materials and imagery from sources as diverse as African traditions, international politics, the high fashion industry and science fiction, Mutu creates works that depict fantastical worlds as places for profound exploration of race, gender and power. Her work is a critical investigation of issues ranging from colonialism to displacement, ritual, perceptions of Africa and the female form. “Wangechi Mutu: A Fantastic Journey” incorporates all aspects of Mutu’s prolific practice which includes collage, drawing, installation, sculpture, performance and video. A new site-specific mixed media mural created for the MOCA presentation will welcome visitors into exhibition galleries, which will be transformed into a forest-like environment populated by the installation of large-scale felt trees. Within this setting, Mutu’s iconic collages will be prominently featured, including new commissions and rare early works. These richly embellished pieces primarily depict female figures set in otherworldly landscapes. Pieced together with human, animal, machine and monstrous parts, Mutu’s heroines appear as seductive and beautiful as they are critical and disturbing. They rule over other worldly landscapes that appear both lushly tropical and post-apocalyptic. In Family Tree, 2012, Mutu’s installation of 13 related collages, the artist constructs a female-dominated creation mythology to explain the origin of the universe. Approximately 30 of the artist’s sketchbook drawings, dating from 1995 to the present, will also be on view, revealing fascinating insight into her creative process. MOCA’s Pavilion Gallery will be transformed into a black box theater for the projection of the artist’s first-ever animated video The End of eating Everything, 2013, in which Mutu brings her elaborate collages to life in a magical narrative set in the sky. Mutu collaborated with musical artist Santigold to create the video’s central character, a flying cyborgian mothership whose voracious consumption leads to its implosion. Two other videos are featured in the exhibition: Eat Cake, 2012, which addresses ritual and overindulgence and Amazing Grace, 2005, a meditation on the slave trade and displaced populations. “Wangechi Mutu: A Fantastic Journey” is curated and organized by Trevor Schoonmaker, the Patsy R. and Raymond D. Nasher Curator of Contemporary Art at the Nasher Museum of Art at Duke University, Durham, NC. Mutu and Schoonmaker will present an Art Talk at MOCA on Friday, April 18 at 7 pm. A comprehensive, 140-page fully illustrated exhibition catalogue with essays by Schoonmaker, Kristine Stiles, and Greg Tate is available for $39.95. “Wangechi Mutu: A Fantastic Journey” has been made possible in part by The Andy Warhol Foundation for the Visual Arts, the Mary Duke Biddle Foundation, the Ford Foundation, Duke University’s Council for the Arts, and the North Carolina Arts Council, a division of the Department of Cultural Resources. MOCA’s showing of the exhibition is made possible by an endowment to the museum established by the John S. and James L. Knight Foundation.